An Upstart Crow Goes Forth! Well, this has been pretty late coming. My apologies. These past two weekends, the internet at our flat in London has been out, meaning that at the precise moment that I’ve actually had things to blog about, I have not had the means to post them for you. Oh well. That just means that instead of just hearing about my day trips to England’s two most famous university towns, you also get to hear about this weekend’s trip to Cardiff. Last Saturday, I got up extremely early in the morning (This is a running theme of these past two weekends) to catch the train to Cambridge. Now, most people, when hearing the name Cambridge think only of the University, but no, in fact, there’s a fairly large city that people live in and everything. In fact, walking from the train station to the city center, it reminded me an awful lot of the part of the Twin Cities that my family used to live in when I was very young. Except, you know, beautiful and amazing. Anyway, the main reason I went to Cambridge, besides it being a major cultural center, was to visit a friend of mine from Middle and High School who’s doing a year abroad there. We had brunch in a church café and then she showed me around a bit. This is a trend I’ve noticed is quite prominent in the less massive UK cities: church cafés. I ate in one way back towards the beginning of term when we were in Stratford, I ate at this one in Cambridge, and again when I was in Cardiff. They very greatly in size, with this one in Cambridge being a full two floors of seating that was larger than most of the commercial restaurants in that part of town while the one in Cardiff being a tiny attic room with barely any room to sit, but they all seem dedicated to spreading the word of God via cheap food and tea. In either case, this particular one had an incredibly good spinach, goat cheese, and summer squash quiche, which we both ordered. Anyway, from there she showed me a few of the colleges. The college system in Cambridge and Oxford is wildly different from what we have in the states in that the University as a whole is more of a confederation of these smaller individual colleges. The thing is that these colleges aren’t generally devoted to a single field as they are in the states. So rather than having, as Millikin does, a College of Arts and Sciences, which is where a history major would take the majority of his classes, and a School of Business, where a business major would take the majority of his classes, Cambridge has, for example, King’s College, where they would both study, even though Trinity College, while still part of the same University, also offers courses in the same subjects. This leads to sort of intra-university rivalries, which I’ll talk more about when we get to Oxford. I know, how tedious. A million buildings that all look like this. It’s basically all imposing, sandstone walls around either a frighteningly green patch of grass that you are absolutely, one hundred percent not allowed to walk on, or else stone tiling or cobblestone that combined with the walls make you feel kind of like you’re in a really classy, academic prison. We didn’t spend a whole lot of time at the colleges, though. Oxford was a whole lot more a facts-and-history visit, while Cambridge was more about catching up with an old friend. So she took me along the river to this bookshop off-campus. I’ve had pretty massive problems containing my propensity for buying books since I don’t exactly have the space in my budget or my suitcase and before meeting Sophie had had to cut my visit to the Cambridge University Press’ shop short for precisely that reason, but this place was absolutely the highlight of my trip. It being a shop, I didn’t feel it was entirely kosher to take pictures, so I’ll try to evoke the feel of the place. It’s the sort of place you can tell used to be a small flat way, way back in the day. There are a couple of independent bookshops like that I’ve come across, but most of them were content to put a book on each wall with a few best-sellers and local interest volumes and call it a day. Not this place. You could scarcely turn around in here without almost knocking something over. Right when we walked in I nearly knocked over an entire shelf of P.G. Wodehouse. The big reason she brought me, though, was the back room. There’s a room in the British Museum called “The Enlightenment Room” which is set up like a posh study with loads of old-looking leather-bound books on the walls, which are really just there to compliment all of the stuffed birds and far eastern art that form the actual exhibition. This back room was the same idea, except the books were the exhibition. Had I been in a position to actually make purchases, I would have walked out either still debating my choices, or else completely broke and trying to figure out how to possibly transport everything. There were volumes in almost perfect condition from as far back as the early 19th century. A biography of a well-known Victorian stage actor seemed like it had never been read; the spine still gave resistance is you tried to open it to the middle. Along the back wall were hundreds of old travelogues, most of which probably never got a second printing, talking about rafting down the Yang-Tze River and hacking virgin paths through the Amazon rainforests. I can only picture all of these guys as pith helmet wearing, khaki-clad, RP-spouting gents with the most amazing handlebar mustaches ever to exist. The Shakespeare section contained the cheapest item that I found: thumb-sized editions of individual plays for ten pounds a-piece. I joked that I’d like to see a thumb-sized complete works, which would have been many, many times thicker than it would be tall. Speaking of which, there was an amazing early 20th century three-volume edition of Shakespeare’s Complete Works with the most beautiful wood-cut illustrations which I was incredibly tempted by before reminding myself that the tragedies alone cost the same as groceries for the entire rest of my time in the UK. Shortly after this, Sophie had to leave for a meeting, so she dropped me at one of the Museums, which was essentially a smaller version of the British museum’s antiquities collection. I did have a good laugh at the fact that much of their Greek and Roman collection used to belong to a Victorian-era Cambridge faculty member who happened to have the named Disney, meaning that you’ll run across a statuette of Aphrodite with “Disney” stamped on the base. After this, I stopped off at the market briefly to buy my sister a present and grab something to eat before heading back to the train station to catch the train home to recuperate for a day before heading out to Oxford. In Oxford, I took a walking tour. A friend suggested a company that operates on a tips-only basis, so I built my day in Oxford around that. The tour guide was clearly well informed, though he did have one of the most impressively pompous and quintessentially Oxford accents I’ve ever heard. He showed us around the larger colleges and talked about the various rivalries and traditions. It’s probably just because my Cambridge experience didn’t have anything analogous to the tour in terms of actual information about the college, but I got the sense that Oxford is much bigger on identification by college and on formulating different traditions around them. For instance, Merton College’s sole ceremony happens in the early hours of the last Sunday of October. During this time, the members of the college walk backwards in a circle in one of the quads wearing academic dress and drinking port wine. This is humorously meant to maintain the integrity of the time-space continuum as Daylight Savings Time ends. At the same time, though, I was struck by the intensity of the external “Town and Gown” rivalry, referring to the tension between the students of the university (“gown”) and the residents of the city of Oxford (“town”) which has existed virtually since the University was founded. Our guide told us about the St. Scholastica Day Riots, which happened in 1355 and amounted to an all out war between the scholars of the university and the men of the city of Oxford and the surrounding countryside with the Chancellor of Oxford University and the Mayor of Oxford leading the two “armies.” The conflict was only brought to an end by the intervention of King Edward III and the matter not formally settled between the two parties until the 600th anniversary of the riots in 1955. As much as the students at Millikin dislike the townies, I can’t picture anything close to this ever happening, and I certainly can’t see President Jeffcoat leading the charge. Not saying it wouldn’t be awesome, just saying I don’t see it happening. Anyway, this is definitely reflected in the layout of Oxford. Unlike in Cambridge, where the city centre is where most of the more prestigious colleges are clustered with little shops and other “town” establishments around them, Oxford is very clearly divided between the city and the colleges and, in most cases, the colleges and other university buildings will be the only things on a given city block. After the tour, I went and had lunch (a very tasty falafel, couscous, and houmous wrap from a shop I’d passed trying to find the starting place for the tour), bought a gift for my mom and rounded out the day with a trip to two of the museums: The Oxford University Museum of Natural History and The Pitt-Rivers Museum of Anthropology, which is connected to it. The Natural History museum was one of the best-laid out museums I’ve been in in awhile. The specimens are organized taxonomically and it’s clear that in laying it out the curators have taken into account what exhibits are likely to be of interest to the average visitor. For instance, the only major break in the taxonomic layout is a case right at the entrance that contains all of the specimens that inspired Louis Carroll when he wrote Alice in Wonderland. Otherwise, you just pick what you want to look at and you go. The same cannot be said for the Pitt-Rivers museum. It is, in a word, an absolute mess. I don’t take pictures in museums for the sake of not doubling the time it takes to get through them, but it is impossible to imagine how cluttered they are. As an illustration, when I get back to the states I’m embarking on an extended research, writing, and performance project involving Ireland’s Bronze Age, which is not particularly well documented, however I have been checking every museum I’ve been to for any artifacts matching this description. At, for instance, the British Museum this is pretty easy because everything is organized by location and era, whereas the Pitt-Rivers, for some reason, is organized by use. So, for instance, all of the weapons are housed on the top floor and, by extension, every single spear from Ancient Rome to 19th Century Africa are all housed in one case, right next to another case full of every sword in the collection. This means that you have to scan every single item in every display case to pick out whether there’s anything in it from the era you’re interested in. Which is the other problem: the collection is massive and it’s all on display. I didn’t get the sense that there were a whole lot of “archives,” so every single artifact is crammed into a display case with the result that trying to take it all in is absolutely exhausting. This seemed like a museum in much need of contemporizing, as it seemed to think that just looking at things is why people go to a museum, so it gives you a lot of things to look at without a whole lot of context or information about the things themselves. I gave up on trying to find any Bronze Age Irish artifacts about halfway through, only having found a few pieces of jewelry in a tiny display in the corner of the second floor. So that’s where all of the spare “w”s and “y”s went! Which brings us to this weekend, during which I visited Sierra, a friend from school who is doing a term at the Royal Welsh College of Music and Drama in Cardiff. Like Cambridge, this trip was more about visiting a friend than about experiencing the history and culture, which is a shame, since I do really enjoy that part of traveling, but at the same time to do both things I’ve discovered you really need more than a day or two in a location. Anyway, I had the extreme bad luck of visiting at the same time as the Wales-New Zealand Rugby Match in Cardiff’s famous Millenium Stadium, meaning that I literally had one choice in terms of hostels, which was a bit more than I was expecting to spend on accommodations. The place itself was fine and I have no major complaints about the business, but since most everyone else staying there was a Kiwi (Not offensive, for the record, though it really sounds like it should be) explicitly there purely for the game. But we’ll get to that later, since that’s really the story to end the post with. I was fine with not having a repeat of my awesome Barcelona hostel experience, though, since, as I said, I was mainly there to visit Sierra. The main event of my trip to Wales was a trip we took to Caerphilly Castle a few hours north of Cardiff. Which doesn't look at all like it belongs to House Greyjoy. The atmosphere was definitely helped by the fact that on the day we visited the rain literally never stopped. It felt quintessentially Northern European, which actually was a rather cool experience. I’m not particularly bothered by cold or rain, and so it definitely helped with the historicism of the whole experience. That afternoon we walked around the various shops and arcades, which are not rooms full of pinball machines, but rather indoor marketplaces. I also found out a bit about the Welsh language, which, like Irish in Ireland, is printed alongside the English on every major sign. It’s probably most famous for using all of the spare “y”s and “w”s that the other languages had left over. This is largely because “w” and “y” are vowels in Welsh, so they get a lot more use and in places which seem odd to speakers of other languages, which is why it may seem to speakers of other languages that Welsh has a consonant surplus. Sierra also said that Wales is trying to bring about a revival in the Welsh language in much the same way Ireland has been slowly doing with Irish Gaelic, which is a cousin tongue to Welsh. The big push right now is to get it taught in schools. Before going back to her flat to drink and hangout, we paid a visit to Chippy Alley, a side street in Cardiff that is famous for its many Fish and Chips shops. I’m a huge fan of Fish and Chips, but since coming to the UK have been disappointed by one thing: the tartar sauce. Not the quality, mind you, but the quantity. Every place I’ve been in London, save one, has not let you get your own tartar sauce, which is a problem because for a huge slab of fish, they will only give you the tiniest tub of sauce. I literally started laughing at one place at the sheer incongruity of it. So imagine my surprise when in Chippy Alley, they gave me not a little tartar sauce, but none whatsoever. They had mayonnaise, one of the component ingredients of tartar sauce, but none of the good stuff. Thankfully the fish was good enough on its own (the key: good fish and chips is horribly greasy) that it was still edible, but I’m starting to get majorly frustrated. If I manage to find a place that will simply let me make my own condiment decisions, believe me, you will hear about it. The place I mentioned before was a stand at the Southwark festival in September, so it’s not like I can just up and go whenever I feel like it, which is unfortunate. Anyway, let me leave you with the reason I was so tired yesterday when I came back. As I mentioned, the town was crowded because of the Rugby match, which had left me in a room full of New Zealanders, one a group of guys who lived in England, and the other a pair of girls who were studying in Dublin. Apparently the rush of the game, in which New Zealand absolutely crushed Wales, was enough to get the old hormones raging for two of them, who, laboring under a grave misapprehension regarding both their ability to refrain from making noise and the ability of the average person to sleep through said noise, decided to engage in sexual activities. In a room with four other people sleeping in it. At five o’clock in the morning. This left me with about two hours of sleep total under my belt for my coach ride back to London the next morning, as well as newly cognizant of my own crippling aloneness. Well, it’s happened. I was afraid that it would and indeed it has. I’ve tried my hardest to avoid it and despite how much I really love this country and this city and the overall vibe here, there’s no denying it anymore. I’ve tried to reactivate and stimulate my mind. I’ve tried to experience new things. Last week I got up at 5:30 in the morning to stand in line for tickets to The River, the new play by Jez Butterworth that’s playing down at the Royal Court Theatre and will probably end up winning him another Tony in a year or so once it makes it to America. It was all cold and miserable and then I got the ticket and felt like a champ and I went back that night and saw the play and it was brilliant and the acting and the directing and the writing were so good that they’ve now caused me to start writing in really horrific run-on sentences. All the same, after the play was over I came down from it really quickly, like when you stay up really, really late drinking until you’re out of beer and there’s only a handful of people awake and about two hours after you’ve stopped drinking all of the sudden you’re no longer drunk but just really, really tired. That was the feeling. So I decided to try something else, so I went to the Tate Museum of Modern Art (I’d post pictures, but I didn’t take any. I have a real problem with people who take pictures in an art gallery.) and figured at the very least I’d be weirded out and, maybe even have my mind blown. So I went, and I saw just about everything in there that didn’t cost extra to go see. I was definitely weirded out and I thought for a second that my mind might have been blown. But then I got to the very top floor, which is where the really weird stuff is and I had that immediate come-down effect again around the time that I saw that someone had roped off a load of air-conditioning ductwork and stuck a plaque next to it with their name and a really pretentious title. Maybe it’s leftover trauma from the really unpleasant job I worked two summers ago at an HVAC company, or maybe it’s just my natural dislike for that brand of “Well, I say it’s art, so it’s art, so there” pretentiousness but at that point I’d had just about enough. I need to take some more trips. It’s been awhile since Barcelona and I haven’t gone off on my own since, so I’m making up a plan to do some cheaper trips inside of the UK for the next few weekends. First off, this weekend I’m going to do the two big university towns: Oxford and Cambridge. My mom lived in Oxford for almost a year, so she’d pretty much kill me if I didn’t visit, and a friend from middle/high school is doing a semester at Cambridge so I figured I might as well visit her. Weekend after, I’m going to go visit another friend in Wales and we’ll go from there. I want to see Edinburgh at some point, though I might do that at the end of term on the way to meet my family in Dublin and I’d also like to do one more international trip to Paris just for a day or two, so we’ll see how those shake out. For now, though, I think the thought of a change of scenery might get me through this week and hopefully I’ll have a cheerier entry for you all soon. Un Corb Advenedizo visita a la ciutat de Gaudí. First off, my sincerest apologies for the lateness of this post, but our flat here in London was sans wi-fi last weekend and the past week has been a bit insane in terms of course work. As a result, I am only just now able to post about my experiences in Barcelona two weekends ago. I don’t think my experience was typical of the average person’s as, somehow, I managed to pick out the one weekend in October that Barcelona got absolutely no sunlight. It was as gray and gloomy as London. As a result, I was regrettably unable to partake in the cities famous clothing-optional beaches, which is a shame, as I don’t think that the Mediterranean has ever seen someone quite that pale. At any rate, I arrived the first day at around noon and wasted much of my day sleeping because I had been up since about four in the morning to make sure I made it to the airport on time and, as we’ve previously discussed, I do not do well with sleeping on planes. I made a good will effort to explore La Rambla, the city’s famous street market, but either it was not in full swing that day, or I was just severely jet-lagged and thus unable to navigate effectively and thus never actually found it, or some combination of both, because I was not overly impressed. This is something that people never tell you about visiting countries where you don’t speak the language fluently: you will never remember the names of things. Ever. Every time I took the subway, I had to repeatedly check the map to ensure that I wasn’t getting the stops confused. Couple that with the fact that Barcelona places its street-signs completely differently than either the UK or the US, and it makes travel a bit harrowing when you don’t entirely have your wits about you. So, after I had finally caught up on my sleep, I finally ran into some of the people I would share my room with. There was a young woman from Northern England, a pair of a pair of Australian girls a few years younger than me, two young Polish women, one of whom had a pretty wild night the night before and so spent most of the time I was there sleeping it off, a chiropractor from the Dominican Republic who was making his way to Belgium, and a pair of Canadians who spent most of their time at the clubs. It was at this point that the trip started turning around for me and, I think, this is the major reason that, especially for young people, hostels are definitely the way to go. See, in a hostel, people want to talk. They want to meet people because, as you may have noticed from that little run-down, it’s not common to get groups of more than two or three, so there isn’t this big sense of a built-in social group. I had been planning to try and meet a few friends who had also traveled to the city, but who were staying in a different hostel, but since none of us had brought our laptops and our phones didn’t work in Spain, I ended up not doing that and instead going with the British woman to a bar nearby called the 4 Cats, which is semi-famous for being the watering hole of both Salvador Dalí and Pablo Picasso. How insecure must you feel as the guy who painted the mural at a bar frequented by two of the greatest painters of all time? While I can’t say for sure that I wouldn’t have had a good time going to the club with my friends, I can say with absolute certainty that without the hostel, I wouldn’t have had this experience, which was way more unique and special, since there are nightclubs absolutely everywhere. Unfortunately, most of the people in my hostel room checked out the next morning, meaning I was traveling alone for the rest of my trip. The next day, I got up just in time for breakfast and then set out for the landmark that I absolutely had to see, the thing that had made me want to go to Barcelona in the first place: La Basílica i Temple Expiatori de la Sagrada Familia. Or as the locals call it, "Old Pointy." Barcelona’s most iconic structure, construction began on Sagrada Familia in 1882 and began to pick up the next year when famed Catalan architect Antoni Gaudí assumed control over the project, imbuing it with his unique architecture style combining Neo Gothic and Art Noveau elements as well as forms derived from Gaudí’s personal studies of natural geometry. The ambition of the project, however, has proved an issue. See, despite having broke ground over a century ago and having been under more or less continuous construction since then, the church is not expected to be completed until somewhere between 2026 and 2028, although in 2010 it was deemed complete enough for the Pope to officially consecrate it. I can only imagine how amazing it will be when it is finally finished. Though the exterior is the more famous image, the interior is one of the most beautiful things I’ve ever seen. Why are you even reading this? Look at the picture! Gaudí wanted to evoke the feeling of being in a forest, and that is definitely felt when you're inside. The stained glass combined with the pillars, which are designed to taper in the same manner as tree trunks, really combine and aid in creating that effect. I’ve been in my fair share of churches and cathedrals, but it’s strange to say that this relatively young one is probably the first time I’ve truly been in awe of the architecture, just because it’s so radically different from anything else I’ve ever seen, at least on such a large scale. I’m not much of a photographer, but I was snapping pictures like a fiend, just trying to capture the experience. I don’t feel like I can write any more eloquently about the building without just kind of devolving into jibber-jabber, so I’ll just say that if you ever get the opportunity to visit Barcelona, Sagrada Familia alone is worth the cost of the trip. On my last day, I decided to check out Gaudí’s second most famous creation, Park Güell. So, after checking out of the hostel and figuring out how to get there, I set off. ¡Decently priced condos and good places to get a latte en la España! It’s incredibly odd how these two starkly different neighborhoods seem to literally be separated only by the Park. It goes along with just how small Barcelona is compared to the other large cities I’m more familiar with (London, Chicago, and New York). It’s like everything has been sort of squeezed into a couple of square miles on the coast of Spain. It’s quite strange. Once I got into the park proper, the other major thing I noticed was the sheer size of it. When I’d seen pictures before, it made the whole thing look rather quaint. But no, once you get there it’s a full on Central or Hyde-style park. There were even locals jogging through it. As with Sagrada Familia I was very taken with the unusual designs which pictures can’t really do justice to since the structures just seem impossible when you look at them in reality. However, because my pack was much heavier than it was the day before since I had to carry everything with me, I decided to make my way to the Plaça Espanya, which one of the young Polish women had suggested to me, where I found a nice little place to sit, have some Sangria, and do some writing before heading to the airport and back home. Barcelona was definitely a new experience for me. I think one the hardest bits is not having a full mastery of the native language. I know a decent amount of Spanish, which is what I used to get by most places, however the majority language in Barcelona is Catalan, which is related but not at all the same, so the point stands. I also feel like the aforementioned bad luck with the weather was a major hindrance. Between these two factors, I felt much less inclined to go out and explore than I do in London or Chicago. Indeed, both nights that I ate dinner in Spain, I ended up just going to the bar attached to my hostel. Though, in my defense, their food was probably some of the best I’ve had in Europe so far. Speaking of which, the hostel scene was definitely the non-architectural highlight of my trip. In the future, that’s definitely the way to go, I think. You meet some incredibly interesting people that way. I’m going to see about taking at least one more trip out of the UK before I go back to the US, and I’m definitely going to stay in a hostel again. Between the price and the experience, there’s really no downside if you’re still young enough to bear the lack of luxuries. In conclusion, despite the weather and the language-barrier, Barcelona was still a great experience. I’m not sure that I ever need to go back, but I definitely had a good time while I was there. So to make up for the lapse in content, I'm gonna try to crank out another long post over the next few days, so be on the lookout for that. Okay, here it is. Here’s the gushing Globe entry. I might do another one after my Shakespeare performance final, but that’ll be an entirely different situation. But coming on the heels of a disappointing experience with the Royal Shakespeare Company, the evening I just had is indescribable. In the interest of the blog, though, I will try. Last weekend, our class was taken on the holy pilgrimage to Stratford-Upon-Avon. Hilariously, most of us had been up the night before doing things that are very characteristic of college students, so we enjoyed very little of the famously picaresque British countryside on the way up. The town of Stratford itself is incredibly quaint. It reminds me a lot of Port Jefferson, the town on Long Island where I was born and where my grandparents still live. It’s large enough to have a good amount of little shops and pretty parks, but not so big that these things are all seedy. The river Avon has a waterfront that feels very much like a miniature version of the docks in Port Jefferson, complete with boats you can rent all of which are named after Shakespeare characters. It seems kind of counterintuitive to name a canoe after the character in The Tempest that causes shipwrecks. And, just a short walk from the town are lovely open fields that make you feel very much like getting a flock of sheep and taking up the pan pipes. Why are you reading this? You really think I have anything to say that more entertaining than that picture? We spent a good amount of time in between our two performances just wandering about. We saw the cottage Shakespeare was born in; we visited his gravesite; we marveled at the full English breakfast that we got for only £5 (including tea). But none of that, except perhaps that last one had quite the effect on me that I expected. For a Shakespeare dork like me, I expected that visiting Shakespeare’s hometown would be like a major religious experience. The thing is, while the town is nice, it doesn’t feel markedly different from your average east coast small town back in the U.S. And it certainly doesn’t feel overly Shakespearean. And then there was the show. We saw The Comedy of Errors and Pericles, Prince of Tyre. Pericles was an amateur cast with the RSC providing the technical and design aspects of the production. As such, I don’t feel right critiquing it too critically. Also, it did not provoke as strong a reaction from me as Comedy of Errors. So, that’s what I’m going to talk about. Let me just say up front that Comedy of Errors is easily my least favorite of all the Shakespeare I’ve read. I have a distinct problem with mistaken identity as a comedic device, but in a play with many other things going for it, like Twelfth Night (Which has a special place in my heart, since a local college production I saw back when I was in high school is what first turned me on to Shakespeare), I can forgive it. The problem is that mistaken identity is what drives the plot entire of Comedy of Errors. To me the notion of a character being able to clear up all of the problems in a story by simply stating one fact (i.e. “I am not from around here. I think you’ve mistaken me for someone else.”) is not comedic. It’s the definition of tragic irony. And tragic definitely seems to be the problem here. Comedy of Errors is being presented alongside Twelfth Night and The Tempest (Both of which are undisputedly far superior plays, in my opinion) as the “Shipwreck Trilogy.” The problem is that out of these three, Comedy is the lightest. There is very little that is philosophically troubling about it. The trouble is that this production, which sets the action in a Central American police-state, is so completely at odds with the source text that I got the impression watching it that the team behind it were more interested in their concept than with Shakespeare’s words, which is a problem since that’s what makes Shakespeare good. His settings are shallow and his plots are nearly all recycled from other sources. His language and his characters are what made him immortal. I don’t have a problem with conceptually driven Shakespeare in general, but if a concept is put on a play, it had better be for a textually supported reason. For instance, the film version of Richard III with Sir Ian McKellen (whom, incidentally, I saw in the audience of another play this past week) sets the story in an alternate universe of the 1930/40s in which England is a fascist state. However, despite the extremity of the concept, it works because it uses the audience’s knowledge to emphasize the inherently vile nature that McKellen’s Richard exudes. By associating the character in the play with a period and figure in history that is cultural shorthand for wickedness and frightening power-lust, the director is able to use his concept to draw out things in the text. In contrast, this production of Comedy of Errors was hindered by its concept by the simple fact that the play contains a great deal of slapstick, which is less funny when the play begins with the Duke of Ephesus water-boarding Egeus. The audience is left unsure of which violence is okay to laugh at. I write this having just come back from the last production I’ll see at The Globe (Hopefully not forever, but at least this year). Technically speaking, it should have been Twelfth Night, which was the last one included in the money we paid for the London program, however Richard III was not included in that program. Luckily, one of my classmates and I were lucky enough to snag tickets for the second-to-last performance before the show transfers to the West End. In short: it was awesome. He was undeniably good as Olivia in Twelfth Night (Both that and Richard are “original practices productions” which recreate the music, design, and casting as closely as possible to Elizabethan/Jacobean standards), however Richard is a star vehicle that a great actor can let his talent run wild with. I already talked about Ian McKellen’s Richard III, which was the extent of my experience with the work walking into the theatre. I was surprised and incredibly moved by the immensely different route Rylance took with the character. McKellen’s Richard is cold, ruthless, and manipulative. We enjoy him because he is so clearly smarter and bolder than those around him. Rylance’s Richard is almost the exact opposite. His physical deformities are far more pronounced, making him physically unthreatening. These are coupled with a pronounced stammer and an almost childlike disposition. The audience is with him because they truly pity him. He does not know how to deal with the world and when he lashes out he does so with the same attitude as a child flipping over the Monopoly board. This comes off as darkly comic for much of the play, however by the time we reach Richard’s monologue right before the climactic final battle, the audience sees how Richard’s actions for the whole play have been an attempt to cure his deep-seated self-loathing, which he only now realizes is doomed to failure. It’s one of the absolute most amazing pieces of acting that I have ever seen. Not just on a technical and dramaturgical level, but because it genuinely touches the audience. For much of my life, I’ve struggled with low self-esteem. Even now, as I’ve found myself slowly shedding the problem, I still from time to time suffer from spells that are frighteningly similar to Rylance’s choked, frantic delivery of that soliloquy. The scene was able to stimulate me not only as a scholar who recognized the literary implications and validity of the choice, not only as an actor who recognized the excellent use of voice, movement, and drawing upon motivation and personal experience, but also as simply a human being who understands what its like to be in that position. I’ve been thinking a lot lately about the philosophy behind theatre. For a while now, at least in intellectual circles, it’s been what I’d call the “Political Philosophy” which holds that theatre should leave the audience unsatisfied, questioning what they just experienced, and thinking about their society. It’s a very Brechtian approach and I’m not saying it’s necessarily entirely without merit, but to me it seems there’s something to be said for the alternative, what I call “Therapeutic Philosophy,” when it’s done well. Let’s face it; modern life is complicated and chaotic. It’s also intensely political. People in America tend to strongly identify with their political party and their views on issues, which create deep social divisions. I don’t know about you, but I really don’t like to be reminded of that fact when I go to the theatre or the movies. There is such a lack of compassion in day to day living that I think we’re only just starting to feel how savagely it affects us. I think that the ideal theatre, therefore, should not foster our feelings of uncertainty and alienation. We’ve got plenty of those just from being in the world. Art should try to provide the audience a safe space to deal with those internal ambiguities and help them come to terms with their realities, thus preparing them to face them with strength and confidence when the play has ended. That’s what I experienced tonight watching Richard III. I recognized my own insecurities in the character and in doing so saw the logical conclusion of dealing with them in an unhealthy manner played out dramatically on the stage of Shakespeare’s Globe. And when I left, I found myself excited to tackle my anxieties in life, because I was sure that I could find a better way of dealing with them than killing a whole bunch of my relatives in a power grab and then using that power to silence everyone I perceived as any sort of threat to me. Well, I’m rambling now and it may or may not be making any sense. I guess that what I’m saying is tonight was a profoundly moving artistic experience for me which was well worth paying £5 to stand in one spot for three hours. I feel like I'm gaining weight just looking at it. In case you can’t make it out (my camera doesn’t do well with glass), that is a poster for Burger King’s Rodeo BBQ line of products, available for a limited time only and, as far as I can make out, only in the United Kingdom. And, while one of the sandwiches looks like a standard Burger King Chicken Sandwich that someone plopped some onion rings and barbecue sauce on, the other looks like something out of a fast food exec’s fever dreams. It’s the same bun as a chicken sandwich, but with three burger patties, cheese, barbecue sauce, and onion rings on it. To top it all off, thanks to stricter laws in this country concerning the display of nutritional information, the poster proudly proclaims that the whole affair contains a modest 734 calories. As soon as I saw that sign, my first thought was “I must try that.” And today, deciding to take a day off from my diet, I finally did. Why Don’t You Put Bacon On It? So, I ordered the Rodeo BBQ Extra Long Beef as well as four chili cheese bites which make up the side dish aspect of this product line (I could have gotten six for a half quid more, but that would’ve just been unhealthy) and deeply hoped that the order combined with my accent would not be taken by the man behind the counter as a confirmation of all of Europe’s stereotypes about Americans. Upon arriving back at the flat with this bounty, I immediately laid it out to compare it to the promotional image. Fast food is like nightclubs: exciting and fun in theory, but lonely and depressing in practice. As always, the poster had greatly exaggerated the size of the sandwich, which for once was probably a good thing. The sandwich on the poster looked absolutely terrifying. It was certainly comforting to note that the patties were not, in fact, the size used on the ordinary burgers but instead the ones used for sliders. So, picture taken, I took a deep breath and took a bite. It wasn’t that bad. I mean, don’t get me wrong, the numbers don’t lie and this is certainly not something I would recommend anyone make a staple of their diet, but at over 700 calories I was anticipating it to be absolutely dripping with grease. It was incredibly salty, but the meat was definitely of a higher quality than at a Burger King back in the states. However, something was definitely off, and I didn’t realize quite what it was until I had finished eating it. The sandwich is intended as a longer version of the barbeque burger, which is my regular if I have the calories to spare when I go to a burger joint. It generally consists of all of the ingredients in the Extra Long, except for one thing. It usually includes bacon. I’m still not sure why they didn’t put bacon on this sandwich. Many of the other burgers available in UK Burger Kings include bacon, so it’s not an issue of availability. I highly doubt that a person who is okay with eating a 734 calorie sandwich is going to not eat a 900 calorie sandwich with bacon on it, so it’s not an issue of health. The standard barbecue burger formula of bun, patty, bacon, fried onions, and barbecue sauce is time honored and delicious, so it’s not an issue of taste. A few weeks ago I had a meal at a Gourmet Burger Kitchen, a chain of sit-down burger joints here in London that, incidentally, make one of the best barbecue burgers I’ve ever tasted, use bacon, so it’s not an issue of regional preference. The only conclusion I can reach is that someone at BK’s headquarters royally dropped the ball. Come on, guys. If you’re going to make unhealthy food, at least do it right. That’s all I have to say about the chili-cheese bites. First off, are “jalapeño poppers” not a thing in the UK? Because that’s what they are. And not only that, they aren’t particularly good ones. While taking a bite out of one for the purposes of taking a picture of the inside (which ended up not turning out for various reasons related to my inability to work a camera effectively), half of the filling went spurting out the other end, usually the mark of an inferior fried food. Not only that but they taste incredibly bland. There is neither a strong flavor of cheese, nor of pepper. After my first one, I had resorted to dunking them in ketchup just so there would be a flavor. I’m still at a loss as to why they didn’t release this product in America. It seems like something we’d be all about as a culture. The only thing I can think of is the consumer watchdog backlash concerning health, but that’s the name of the game in the fast food industry. Based on this and a few other experiences, I’ve come to the conclusion that while fewer preservatives and higher food quality standards may play a part in the UK’s lower obesity rating, the difference is the attitude the British have towards unhealthy food. A sandwich with two meals worth of calories can be released in the UK because the British consumer is less likely to eat at Burger King on a regular basis. The street that I live on has both a Burger King and a McDonald’s, but there’s hardly ever anyone in there except for after midnight, which makes sense because if your late-night drunk food is a salad, I’m sorry, but you are a strange individual. In contrast, I was at this place right at dinnertime and there were maybe three people eating and no one but me in line for food. This is why a British person can be trusted with the option of ordering the Rodeo BBQ Extra Long Beef: he’s not going to do it as often. This past week we went as a class to the British Museum, which, despite what the brothers Gershwin would have you believe, has not lost its charm. I can’t imagine anyone having time to go through and fully appreciate everything on display there. One of our British instructors joked that the British Museum is essentially England’s way of making up for how much stuff it’s looted from other countries during the time of the British Empire. Anyway, for this week’s post, we were specifically asked to post about a specific exhibit and though I promised myself going in that I would try to not talk about Shakespeare (Up until the last ten minutes at the museum, I was planning on talking about the impressive collection of Buddhist artifacts in the museum’s permanent collection), I ended up seeing something that just has to be commented on. So, one of the big draws of the Museum this summer has been a special exhibition titled Shakespeare: Staging the World, which takes an historicist approach to Shakespeare’s work. The artifacts on display are generally contemporary to his life and connected to his work. The attendant comments discuss the manner in which the world he lived in effected the content of his plays. This was all interesting; some of it was stuff I already knew, while there were good swaths of information I’d never heard before. However, the only thing that is really worth extended discussion, in my opinion, is the very last object in the exhibition. The exhibition didn't allow photography, so I had to take this from a newspaper article. This particular book is nicknamed “The Robben Island Bible.” During the struggle against apartheid in South Africa, Robben Island was one of the main facilities used to house political prisoners. One of the internees was a man named Sonny Venkatrathnam, who brought with him a copy of Shakespeare’s Complete Works. Prisoners were not allowed reading material and the book was confiscated. 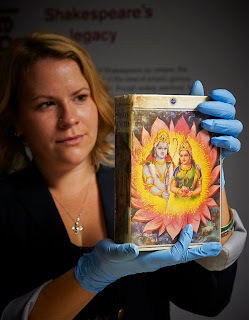 However, Venkatrathnam managed to get it back by convincing the warden, who we can only assume was not greatly knowledgeable in the fields of English literature or eastern religion, that the book was a Hindu Bible written by William Shakespeare. To further the ruse, he pasted images of Hindu deities from Diwali cards sent to him by his family to the spine and cover. The book became a source of discussion and entertainment for the anti-apartheid activists interned at Robben Island, including future South African president Nelson Mandela. Venkatrathnam encouraged the inmates to sign their names next to passages they found particularly moving. Mandela selected Julius Caesar’s short speech to his wife, which I have excerpted for the introductory quote for this post. I think this is an absolutely incredible story. I’ll admit that I know very little about the struggle against apartheid, having been born in a country that is famously under-informed about foreign affairs two years after the official abolishment of the policy and two years before Mandela was elected. However, I do know that it was far from a tidy little conflict and that political prisoners were not treated in the most humane manner. I think its fascinating that in the face of such terrible circumstances, this book that was brought in under the guise of a Bible ended up serving the same purpose: to give comfort to people in times of difficulty. I think that this is the kind of story that needs to be told more often. The average person doesn’t ever think of Shakespeare as much other than really old plays that they have to read for English class in High School. But once you get past the initial difficulty of the language (Which, in my experience, doesn’t take very long if you’re really willing to try), there’s such an immense amount to be drawn from his works. I don’t think the men on Robben Island could have been better off if they had a real Bible. So, there’s a side to the whole study abroad experience that doesn’t really get talked about much. For many people, including me, this is the first time they have to regularly buy their own groceries. At school, I’ve got a meal plan, and at home I’ve got mom. So not only have I been thrown into the deep end on the whole providing-for-myself thing, I’ve also had to learn to swim in an unfamiliar swimming pool. For the most part, I tend to do my shopping at this place called The Co-Operative about a block down the road from my flat. There’s a Marks and Spencer next door, but they’re much more expensive, as well as a Sainsbury’s quite a ways away, but that’s a bit of a trip. The Co-Op is a little shop with a lot of food that is cheap but expires fast. Fortunately I haven’t encountered a whole lot of trouble with that yet, since I shop on a weekly basis and only have to buy for one. The other advantage is that they sell a lot of stuff that doesn’t require a lot of “assembly.” More on that later. 1. Stuff that I don’t have to do anything to. Your Greek Yogurt, your fresh fruit (Which, incidentally, is AMAZING here), and your digestive biscuits. Pretty self explanatory: open package, remove food, put in mouth. 2. Stuff that you just have to reheat. Heinz is not just a ketchup company in England. In addition to the famous beans that the Brits are notorious for enjoying on their toast, I’ve encountered their canned Macaroni and Cheese (yes, you read that correctly), their version of Spaghetti-Os, and their canned beef-filled ravioli. They’ve all been if not delicious, at least palatable. They’ll fill you up, they’ve all been under 400 calories per can, and they only cost about a quid and a half. 3. Stuff that can be easily combined with other stuff to make you feel like you’re cooking when you’re not. Sandwiches are wonderful things. So are breakfast cereals. But the king of this category is hummus. Or “houmous” as it’s spelled here. Either way, the past two times I’ve been, The Co-Op has been running a deal on all of their varieties. The Moroccan is a life-changing experience. 50 grams of houmous (Which is a heck of a lot of houmous) and a pita or two is a low-cal lunch that tastes like spicy, chickpea angels are tap-dancing on your tongue. There’s a phrase I didn’t think I’d ever type. 1. In British grocery stores, they don’t refrigerate the eggs. I haven’t personally bought any (They fit nowhere in my acceptable criteria for groceries. ), but from what I’ve heard from my flat-mates they taste better as a result of this. 2. Nothing here is re-sealable. Even stuff like a package of deli meat or a couple of pitas that you couldn’t possibly be expected to finish in one sitting has to be put into a bag. Also, The Co-Op doesn’t sell Ziploc bags. 3. Alcohol comes packaged like soda. In that, at The Co-Operative, you can buy a two-litre plastic bottle of Strongbow Hard Cider for under £5. It’s 5% alcohol and tastes like apple juice. Which is both wonderful and dangerous. I am a theatre and creative writing double major at Millikin University and an aspiring actor and playwright. I also dabble in poetry. Netflix is one of the greatest things to ever happen to me.